Go to original pattern for design DROPS 194-27. 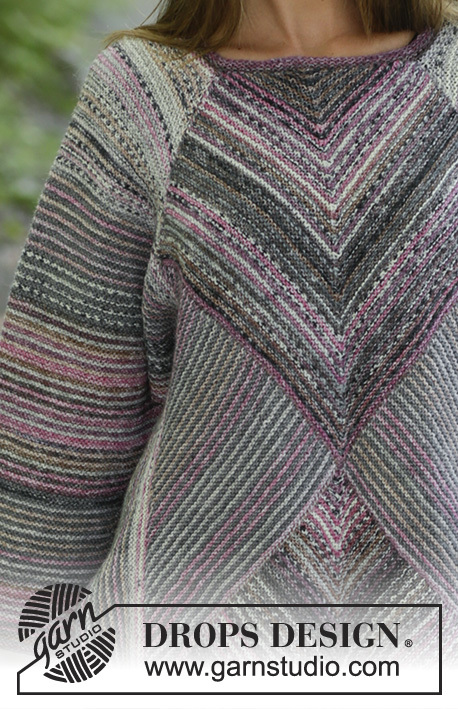 Knitted tunic in DROPS Fabel. The piece is worked back and forth with garter stitch, domino squares and stripes. Sizes S - XXXL. 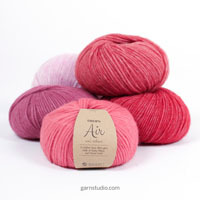 DROPS CIRCULAR NEEDLE SIZE 3.5 MM: length 40 cm and 80 cm for garter stitch. * 1 ridge wooden rose, 1 ridge salt and pepper *, work from *-*. * 1 ridge rose mist, 1 ridge grey *, work from *-*. Work 15-15-16-16-17-17 cm with * 1 ridge rose mist, 1 ridge salt and pepper *, work from *-*. Work 5 cm with * 1 ridge rose mist, 1 ridge grey *, work from *-*. Work 3 cm with * 1 ridge salt and pepper, 1 ridge grey *, work from *-*. Work 15 cm with * 1 ridge wooden rose, 1 ridge rose mist *, work from *-*. Work 1 cm with * 1 ridge grey, 1 ridge salt and pepper *, work from *-*. Work 8 cm with * 1 ridge rose mist, 1 ridge grey *, work from *-*. Work 4 cm with * 1 ridge wooden rose, 1 ridge rose mist *, work from *-*. Continue to finished length with * 1 ridge grey, 1 ridge wooden rose *, work from *-*. 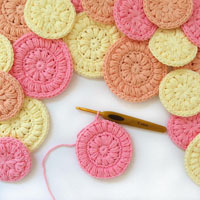 The piece is worked back and forth with circular needle. You first work whole and half domino squares. 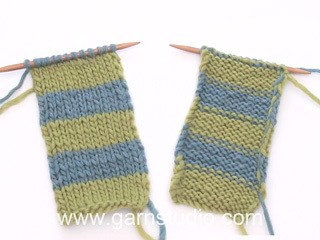 Then work the shoulder and pick up stitches down the edge of the section with domino squares before working garter stitch and stripes out to the side for body and sleeves. 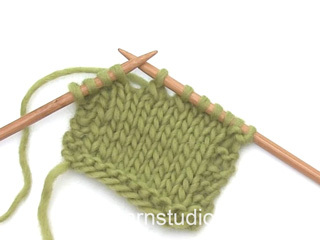 ROW 2 (= right side): Knit until there is 1 stitch left before the marker, slip 1 stitch as if to knit, knit 2 together and pass the slipped stitch over the knitted together stitches, knit to end of row. Repeat rows 1 and 2, i.e. 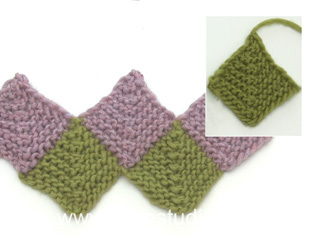 decrease 2 stitches in middle of square every 2nd row until there is stitch left on the row. Cut the strand and pull it through the stitch. The domino square measures approx. 28-28-30-30-31-31 x 28-28-30-30-31-31 cm. ROW 2 (= right side): Knit 2 together, knit to end of row. Repeat rows 1 and 2, i.e. decrease 1 stitch every 2nd row until there is 1 stitch left on the row. Cut the strand and pull it through the stitch. ROW 2 (= right side): Knit until there are 2 stitches left on row, slip 1 stitch as if to knit, knit 1 and pass the slipped stitch over the knitted stitch. Repeat rows 1 and 2, i.e. decrease 1 stitch every 2nd row until there is 1 stitch left. Cut strand and pull it through the stitch. ROW 83-83-87-87-95-95 (= wrong side): Knit. ROW 84-84-88-88-96-96 (= right side): Knit 2 together, knit until there is 1 stitch left before the marker, slip 1 stitch as if to knit, knit 2 together and pass the slipped stitch over the knitted together stitches, knit until there are 2 stitches left on row, slip 1 stitch as if to knit, knit 1 and pass the slipped stitch over the knitted stitch. Repeat these last 2 rows, i.e. you decrease 2 stitches middle of square and 1 stitch in each side (= 4 stitches decreased) every 2nd row until there are 3 stitches left on row. Knit 1 row over all stitches, then work the last row as follows: Slip 1 stitch as if to knit, knit 2 together and pass the slipped stitch over the knitted together stitches = 1 stitch left. Cut strand and pull it through stitch. Cast on and work in same way as front piece. Cast off stitches at beginning of every 4th row (every 2nd ridge) in each side as follows: Cast off 5 stitches 4-4-5-5-5-5 times, 2 stitches 7-7-8-8-9-9 times and 1 stitch 14-13-12-11-10-9 times = 81-83-85-87-89-91 stitches. Continue until the sleeve measures 53-54-55-56-56-57 cm from the cast-on edge. Cast off. Make sure that the cast-off edge is not tight. 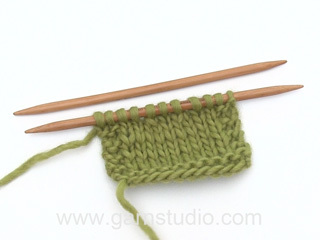 Work in the same way as left shoulder, side of body (i.e., knit up stitches along the side of square (3)) and sleeve. 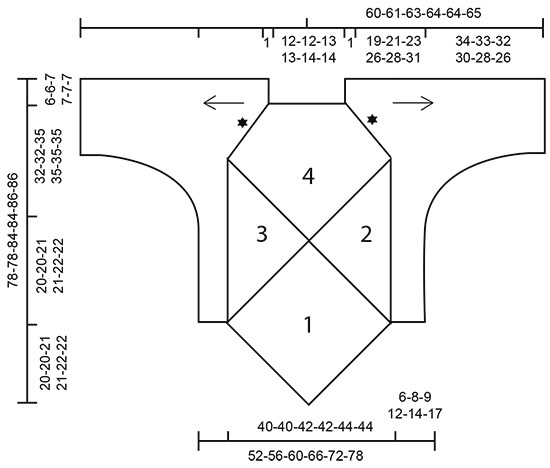 Sew seam in raglan line – see black star in illustration. Sew with rose mist and sew in the outermost stitch-loop so that the seam is flat. Make sure that the seam is not tight. Sew sleeve seam from the cast-off edge at bottom of sleeve and upwards to the marker which was inserted before casting off 46-46-48-48-51-51 stitches for side in tunic. Repeat in other side. Start in the one raglan seam from the right side and knit up 118-140 stitches with short circular needle size 3.5 mm and wooden rose. Work 3 RIDGES in the round - read description above. Cast off with knit. Cut and fasten strand.